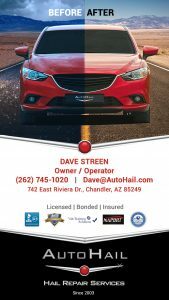 If you suffered hail damage from the severe storm on October 21, 2018 in Gold Canyon, AZ or surrounding area, we are here to help. When your vehicle gets a single door ding, it can ruin your day so trust us, we know how you feel seeing dents all over your beautiful car. Don’t worry, in a few easy steps, we will have you back on the road and looking like the storm never happened. In fact, even better as we will also fix the other dents and dings you may have had before the bad weather. Paintless Dent Removal (PDR for short) is the art of massaging the dents out of the panel without disturbing the paint. As you can imagine, not all PDR techs are created equal. At AutoHail we have traveled around the globe for decades repairing vehicles in about a dozen countries. This has allowed us to learn much more advanced techniques than your typical dent guy who only repairs side panels locally. Although we travel around the world, our headquarters and home is just west of you in Chandler, AZ. We use special lighting and the most advanced software to provide you with an accurate quote in minutes. We stand behind our estimates and we back all of our work with a lifetime warranty and it is in writing! nt brings a different experience keeping our work unique and exciting. Over the years we’ve received more than a few awards for our customer service but we prefer to let our work speak for itself. 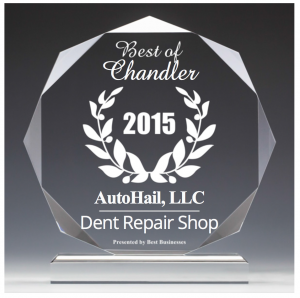 Call 480-442-4544 to find out what makes Auto Hail the best in Gold Canyon Arizona dent repair!